We all know how depressing Valentine’s Day can be if you don’t have someone to spend the day with or how discouraging it is when it seems that everyone you know is getting flowers, candy, or a special dinner (even if it’s just a homemade dinner). As much as we all complain and rant about a manufactured holiday, it can be very hard for many people. A Google search for “Valentine’s Day depression” yields over 5 million results. That’s a lot of sadness over one day. So this year, I challenge you to pick at least one friend or family member and do something to make their day special. It doesn’t have to take a lot of time or even cost any money. Just let them know something that you like or love about them. Don’t just say, “Happy Valentine’s Day!” (Because if it isn’t, that will make them feel worse.) Take a minute to let them know they’re important. Or you can do more, such as bring them a coffee or take them out to lunch. Just make sure you’re not choosing someone who may misunderstand your encouragement as an invitation to a romantic relationship. It is Valentine’s Day, after all, and we don’t want to make anyone feel hurt or embarrassed. Do you have any more ideas for ways to brighten someone’s Valentine’s Day? 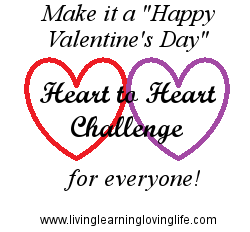 This entry was posted in Life and tagged encouragement, friendship, love, Valentine's Day by Amanda Beaty. Bookmark the permalink.